CUSTARD FILLING: In medium saucepan heat milk slowly just until bubbles form around the edge. In small bowl, combine sugar and cornstarch, mixing well. Stir into hot milk all at once. Cook, stirring, over medium heat until mixture boils. Reduce heat and simmer 1 minute. Beat a small amount of mixture into egg yolks. Pour back into saucepan and cook, stirring, over medium heat until mixture boils and thickens. Place waxed paper on surface to prevent skin from forming. GLAZE: In top of double boiler, over hot (not boiling) water, melt chocolate with shortening. Add corn syrup and milk. 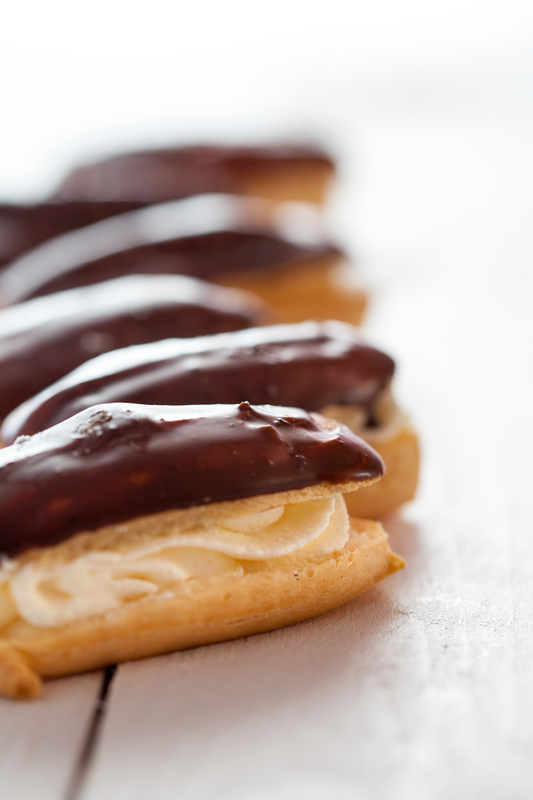 ECLAIRS: Bring water, butter and salt to boil. Beat over low heat until mixture leaves sides of pan. Beat until shiny and satiny and broken in strands. Drop three inches apart on ungreased sheet. Form 12 strips 4 x 1 inches. Bake at 400F for 35 to 40 minutes. (Will sound hollow when tapped, keep from drafts). Slit tops of eclairs and fill with custard. Spread tops with chocolate glaze, chill and serve. NOTES : I've been making these since They are wonderful. Recipe by: McCalls Cookbook Collection - Dessert Discoveries Posted to T.nt (sdm-marked) Recipes Digest by "Barbara Zack" on May 8, 1998.